Christie Blatchford, originally uploaded by johnwmacdonald. 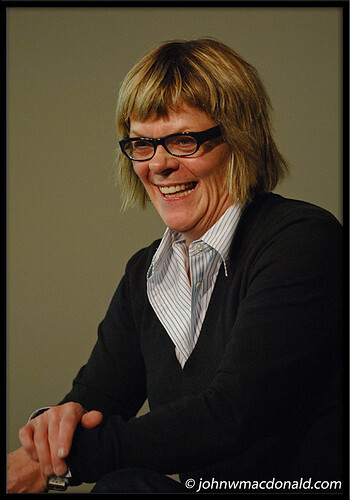 "Long before she made her first trip to Afghanistan as an embedded reporter for The Globe and Mail, Christie Blatchford was already one of Canada’s most respected and eagerly read journalists. It is a testament to Christie Blatchford’s skills and integrity that along with the admiration of her readers, she won the respect and trust of the soldiers. They share breathtakingly honest accounts of their desire to serve, their willingness to confront fear and danger in the battlefield, their loyalty towards each other and the heartbreak occasioned by the loss of one of their own. Grounded in insights gained over the course of three trips to Afghanistan in 2006, and drawing on hundreds of hours of interviews not only with the servicemen and -women with whom she shared so much, but with their commanders and family members as well, Christie Blatchford creates a detailed, complex and deeply affecting picture of military life in the twenty-first century." Please contact me for usage rights for photograph. Please do not use this image without consent.